The Dalmatian is a very popular breed known for their energetic attitudes and abilities to run for long distances with ease. In order to maintain a happy Dalmatian, they will need to have an outlet to play or run each day or they can become bored easily and even get into mischief. They are great around horses, but may not be as comfortable around other dogs or even strangers that may enter their homes. They possess such a high level of energy that they may not be suitable for every household with small children residing in it. They can be stubborn at times, but generally are very pleasant dogs. The Dalmatian needs activity, plain and simple. If you plan on owning one of these dogs, plan to have an active lifestyle to fit their needs. They make excellent dogs for runners or families that enjoy the outdoors. They do bode a fur coat that can kept hem warm in colder climates and they are equally as adaptable in warmer climates, but overall it is best if the Dalmatian resides indoors. They do not require a lot of grooming, just a basic brushing each week will suffice. They are popular dogs for their abilities to be excellent watchdogs and protectors of their families, while maintaining a sweet and affectionate demeanor as well. 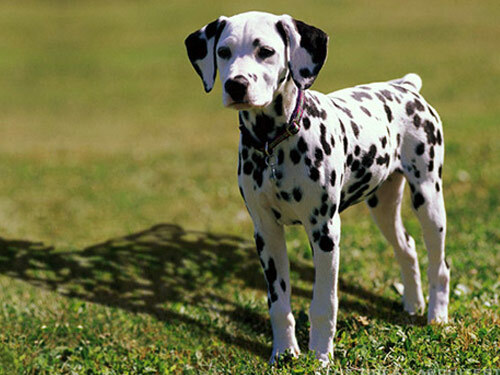 The Dalmatian is one breed that has a tendency to develop hearing loss. They can also develop urinary stones and allergies. Some have been noted to experience CHD, overactive thyroid glands, seizures and iris sphincter Dysplasia as well. The vet may recommend screening for their eyesight, hearing, hips and thyroid as they progress in age. Expected lifespan of a Dalmatian is from twelve to fourteen years long. They generally weigh between forty and sixty pounds as full grown dogs and may not be suitable for residing in a smaller space such as an apartment. They have also been noted to have difficulties metabolizing acid in the urine, which is the root of the urinary stones they can develop on occasions. Originating in Yugoslavia, from a time experts have yet to truly define, the Dalmatian is one fo the most recognizable dog breeds with their signature white fur and black spots. Many still associate them with working closely alongside the fire departments, as they were once utilized to aide in coaching the horse drawn fire engines which gave them the name as "firedogs." They received their nod from the AKC in 1888 and have been through a rollercoaster of popularity from decade to decade in the 19th century. Once the many films on the big screen featured Dalmatians in them, many children decided they were the dog of choice for families around the world intrigued by the Dalmatians success in films. This breed coming from the Ancient Times era once served as a carriage dog and still is a very common household pet in the United States. They make excellent companions and many active people enjoy the Dalmatian as a pet that can easily keep up with their lifestyles.